A bad start for Big Isle teams at the softball championships on Oahu – all four teams lost their opening games and are now out of contention for state titles. The sole isle team in Division I, No. 4 seed Hilo, was spanked by unseeded Kapolei, 14-0. In Division II, unseeded Kohala fell to Waipahu, 11-0, while Honokaa was tromped by Kalaheo, 12-4. Meanwhile, No. 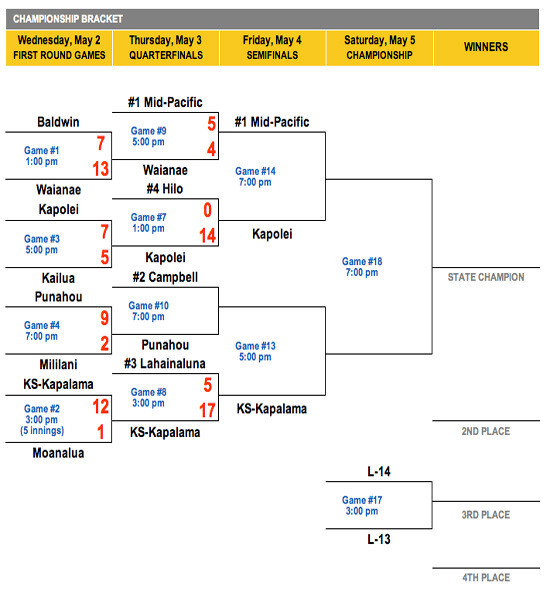 3 seed Kamehameha Schools Hawaii, which had a first round bye, was dropped by Kauai, 12-2. This means all Big Island teams fall into the consolation brackets and best they can do is fifth place overall.